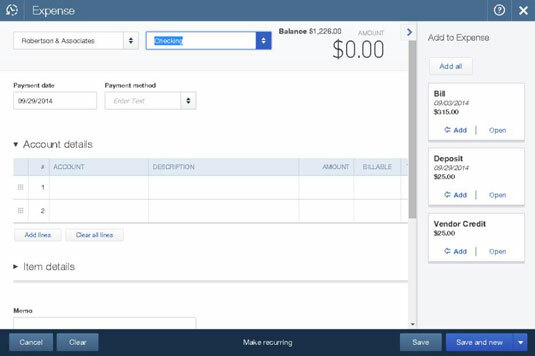 In QuickBooks Online (QBO), you enter a vendor credit to record returns to vendors or refunds from vendors. A vendor might supply you with a credit document that indicates you no longer owe the amount stated on the document, or the vendor might issue a refund check to you. If a vendor issues a credit document, you enter a vendor credit and then apply it when you pay the vendor’s bill. If a vendor issues a refund check to you, you still enter a vendor credit, but you also enter a deposit and then link the deposit to the refund check. Click the Create plus (+) sign and, from the Create menu that appears, choose Vendor Credit. 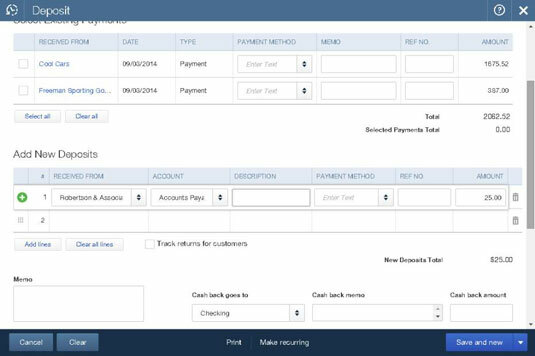 QBO displays the Vendor Credit window shown. Select the vendor who issued the credit. Enter the date of the credit. In the Account Details section, select the account used on the original bill. If you received the credit because you returned items to the vendor, select the items you returned in the Item Details section. You can optionally scroll down and attach an electronic copy of the credit to the Vendor Credit transaction. Click the arrow beside Save and New and choose Save and Close. The Save option referenced in Step 7 is called a sticky preference, which means that after you select Save and Close, it will appear as the default Save option the next time you display this screen. Click the Create plus (+) sign and, from the Create menu that appears, choose Bank Deposits. 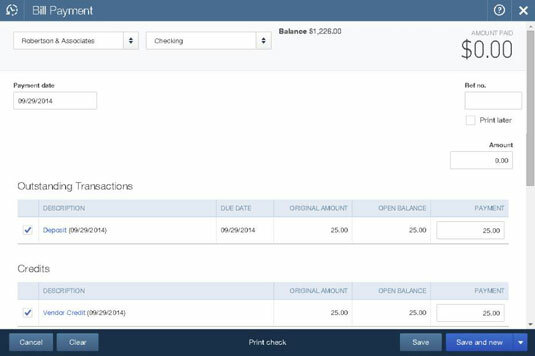 QBO displays the Deposit transaction window shown. In the Received From column, select the vendor who issued the check. In the Account column, select the Accounts Payable account. In the Amount column, enter the amount of the check. The Save option functions as a sticky preference and you might not see Save and New because you previously made a different choice. Click the Create plus (+) sign and, from the Create menu that appears, choose Expense. Select the vendor whose refund check you deposited. QBO displays available deposits, credits, and bills. Click Add in the outstanding vendor credit. Click Add in the Deposit. 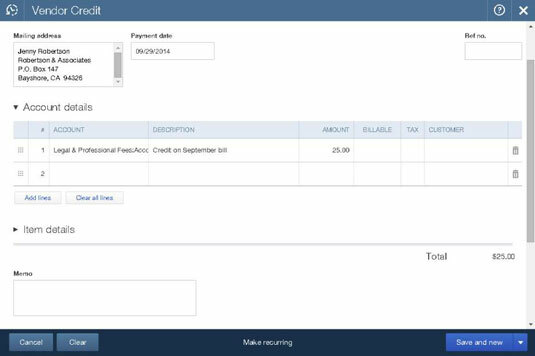 When you add these two transactions to the Expense, QBO creates a Bill Payment transaction with a net value of $0. QBO also applies the vendor credit to the deposit.